Invest in the best cryptocurrencies on autopilot! 800% higher returns compared to a diversified crypto portfolio. 1,100% higher returns compared to a Bitcoin-only portfolio. Automatically invest in the best cryptocurrencies on a schedule of your choosing. Never worry about managing your investments. Automatically drop poor performers and invest in the best coins! Crypto Booster has a variety of great features that make crypto investing easy. Consistently invest in the best cryptocurrencies over time. Update your portfolio and change your investing settings in seconds. Keep track of all your crypto investments in one place. Easily Create And Manage Your Binance API Keys Here. Crypto Booster only allows Trade-Only API keys. We will reject any keys with withdrawal permissions. Crypto Booster NEVER has the ability to withdraw your funds. What are Crypto Booster's Pricing Plans? Crypto Booster offers a monthly plan at $14.95 per month. We also offer a yearly plan at $149.95 per year which works out to $12.49 per month. Finally, we offer a one-time payment option for $399.95. Can I trust Crypto Booster with my API keys? Crypto Booster only allows Trade-Only API keys. We will reject any keys with withdrawal permissions. Crypto Booster NEVER has the ability to withdraw your funds. In addition, API keys are stored using 256-bit encryption. Crypto Booster also supports IP address whitelisting in conjunction with exchanges that support this feature. How does Crypto Booster protect itself against hackers? Crypto Booster uses industry standard security practices to ensure that all sensitive data is encrypted. Crypto Booster stores data using 256-bit encryption. In addition, IP address whitelisting is supported preventing unauthorized 3rd parties from making use of your API keys. Crypto Booster Is Also A McAfee SECURE Verified Website. Finally, Crypto Booster will reject any API keys with withdrawal permissions, meaning neither Crypto Booster nor unauthorized 3rd parties will ever have the ability to withdraw your funds from an exchange. How can I customize my portfolio? 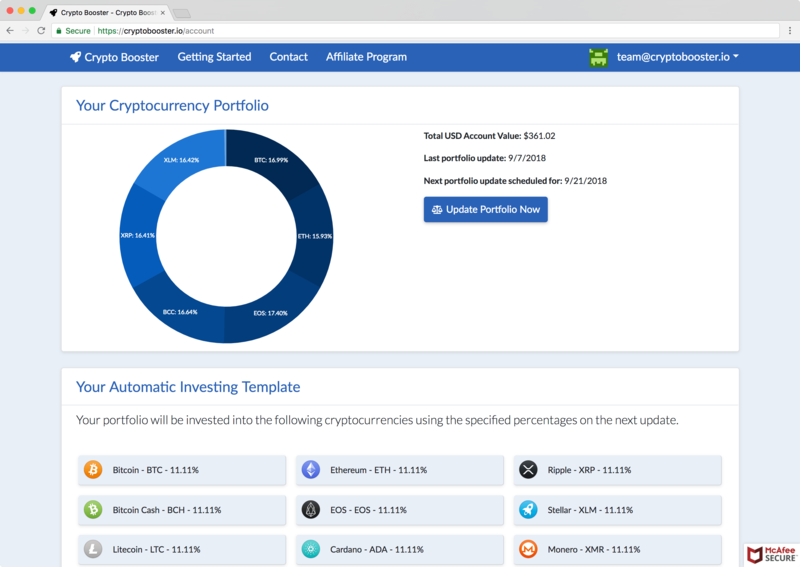 Crypto Booster allows for a large variety of different portfolio configurations. You can start a free trial to see exactly what options are available to you by clicking HERE. How does Crypto Booster handle Tether and other stable coins? Crypto Booster ignores Tether. Meaning, Crypto Booster will not execute buy or sell orders for Tether. This means that Crypto Booster will never rebalance a portion of your portfolio into Tether. Additionally, any Tether that you already own on an exchange account will be ignored when Crypto Booster rebalances your portfolio. However, other stable coins such as TrueUSD are not ignored at the moment. Can't I just do this myself? Why use Crypto Booster? Crypto Booster can save hundreds of hours of your time in the long run by automating the rebalancing and diversification process for you. Crypto Booster does all of the calculations and trades for you, on a schedule of your choosing, automatically. Does Crypto Booster have any further upcoming features? Yes! We are constantly trying to improve and add more features to Crypto Booster. We plan to add support for more cryptocurrency exchanges such as Bittrex. Other features such as being able to easily convert your entire portfolio to Tether, or choosing individual coins to rebalance into, are planned as well. Do you have any other data that shows the past performance of rebalancing and diversifying? Yes! We have a full case study where we cover a variety of different portfolio configurations. Click Here To Read The Free Case Study! Does Crypto Booster have an affiliate program? Yes! We're proud to say that Crypto Booster offers one of the best recurring affiliate programs in the cryptocurrency space! For every customer you refer, get a 66% commission ($10) the first month and 33% recurring commissions ($5) every month afterwards! Click Here To Become An Affiliate! © 2018 Crypto Booster. All Rights Reserved.